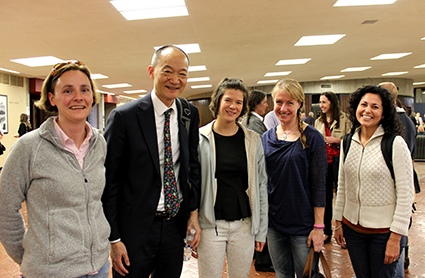 FERC Commissioner Norman Bay gave a talk at the Law School on March 20. Bay introduced the talk with a clip from House of Cards, when Vice President Francis ‘Frank’ Underwood (Kevin Spacey) threatens billionaire industry tycoon Raymond Tusk (Gerald McRaney) with a FERC investigation (Season 2 – Episode 6). 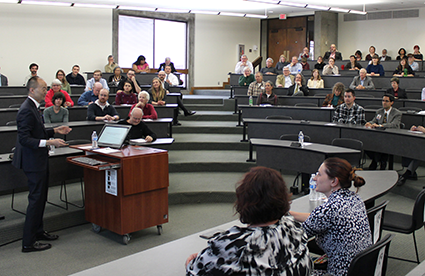 His talk included a description of FERC, what it does, the commission, its history, and what it regulates. He also gave an overview of the energy markets today, focusing on significant trends and developments in oil, gas, and electricity. 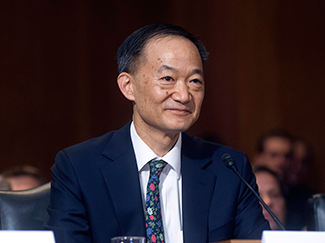 Bay also discussed several emerging challenges in the energy markets and said that it was “a time of great change.” These include the shale revolution, the abundance of energy, the growth of renewables, environmental rules, low load growth, and increases in energy efficiency. Bay closed his talk by talking about a time of great change, evidenced by the shale revolution, an abundance of energy, and increases in energy efficiency. Commissioner Bay was welcomed back to the School of Law by a large group of alumni and former colleagues from his days as professor here. A reception was held in his honor following the lecture. 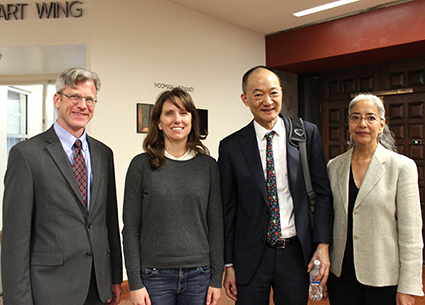 This event was hosted by the UNM School of Law Natural Resources and Environmental Law Program, the Utton Center and the Office of Advancement in cooperation with the Natural Resources, Energy and Environmental Law Section of the New Mexico Bar Association. Adrian Oglesby, Director of the Utton Center, and Bay with Deana Bennett of Modrall-Sperling and Professor Eileen Gauna. Several former students came to see Bay, who was voted “Best Law Professor” when he taught at UNM.